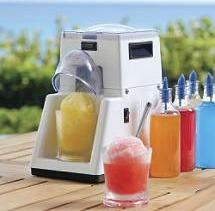 Small snow cone machine makes 1 at a time. Ice not included.Recommend 10 lb bag of ice cubes. Flavored toppings Include: 4 Flavors. IF YOU ORDER WITHOUT AN INFLATABLE A $40 NON-INFLATABLE FEE WILL BE ADDED.